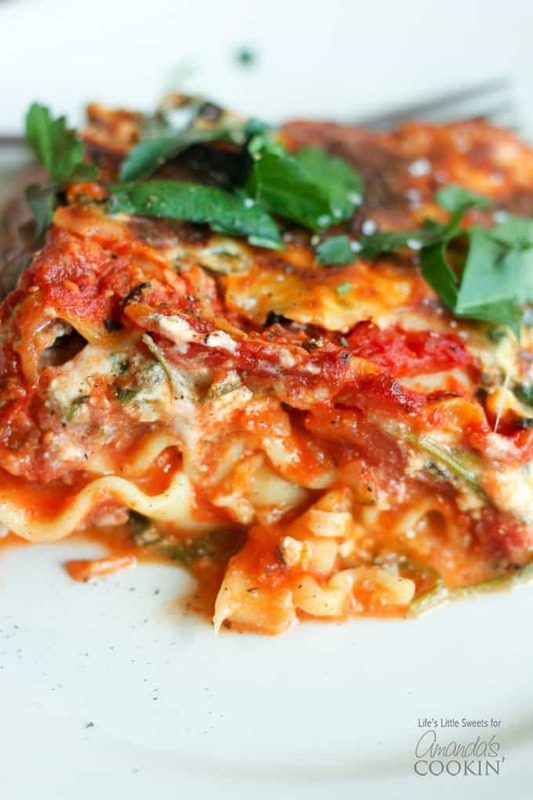 Veggie Lasagna: a delicious and flavorful dinner dish loaded with veggies! 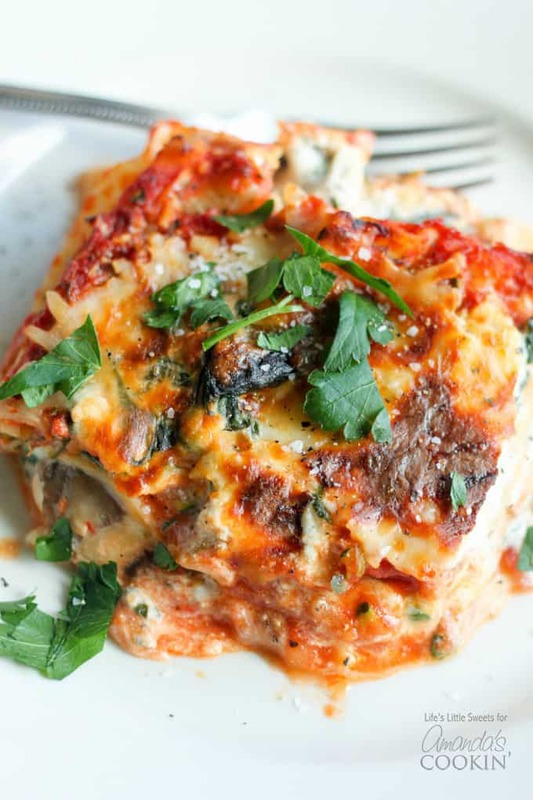 This Veggie Lasagna is packed with vegetables including sauted baby spinach, Crimini (Baby Bella) mushrooms, grated zucchini and topped with Italian parsley. 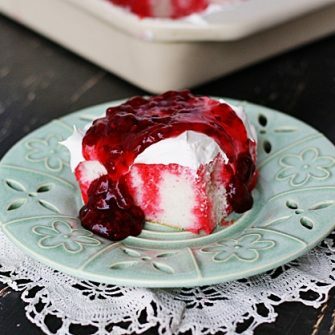 It also has ricotta and mozzarella cheese with oregano which adds to its delicious flavor. 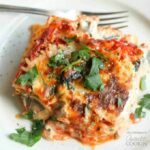 While one of our all time favorites is this Italian Lasagna with meat, this vegetable lasagna also makes for a hearty dinner dish! 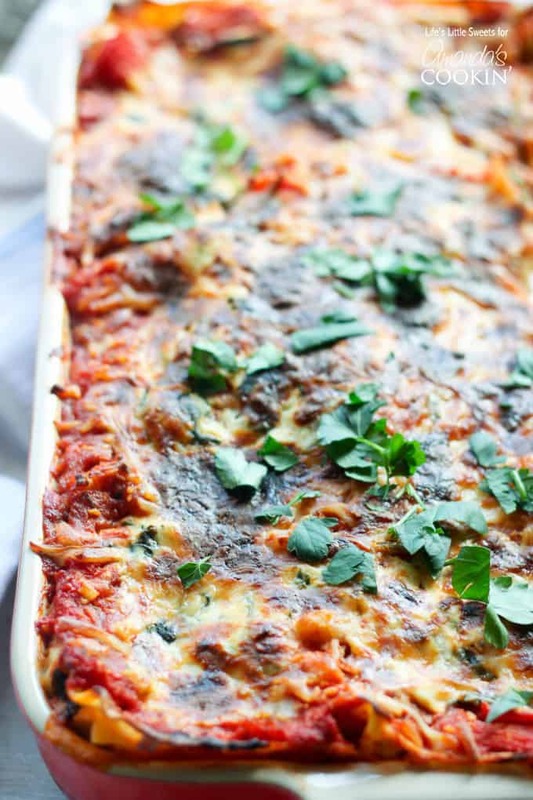 This Veggie Lasagna is satisfying, savory, delicious and there’s plenty for everyone! It’s the perfect one-dish dinner or you can also serve it with a side salad and fresh garlic bread. It would be great to bring to a potluck or family dinner because it makes a 13 in x 9 dish which is plenty to go around. 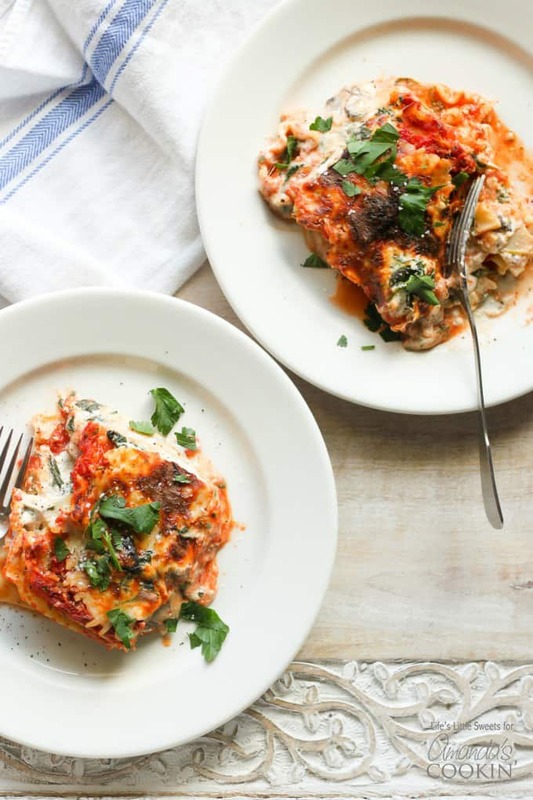 The inspiration to make this Veggie Lasagna comes from my Sister-in-Law, Nicole, she always makes a killer vegetable lasagna often with veggies from her garden. I also took some inspiration from this Vegetarian Lasagna from Betty Crocker. I grew up with the classic Betty Crocker cookbook, so many good family favorites in there! This recipe requires an 8 hour time for it to set. You can bake it right away but it does taste much better when the ingredients have had time to marinate together. I hope you enjoy this Veggie Lasagna recipe! Serve this delicious lasagna with these Gooey Garlic Cheese Rolls or these Parmesan Garlic Rolls! If you need another one pan dinner idea, be sure to try this very popular John Wayne Casserole. Enjoy! 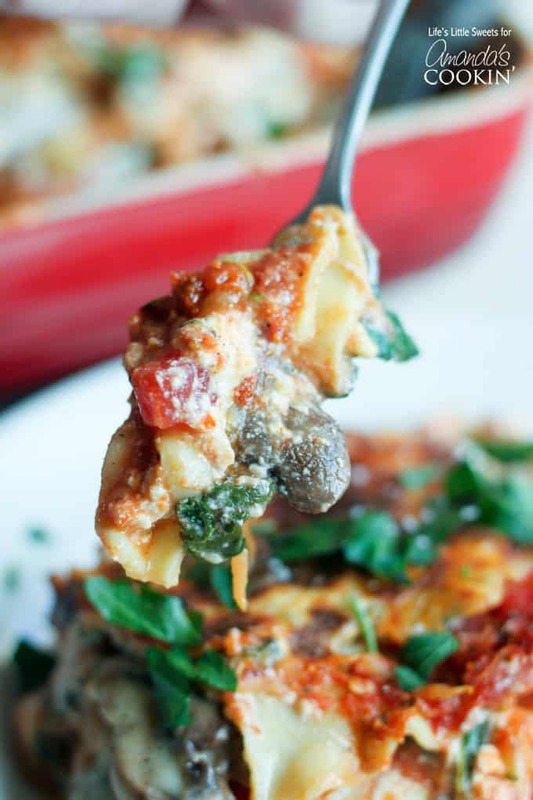 This Veggie Lasagna is packed with vegetables including sauteed baby spinach and Crimini (Baby Bella) mushrooms, grated zucchini and topped with Italian parsley. 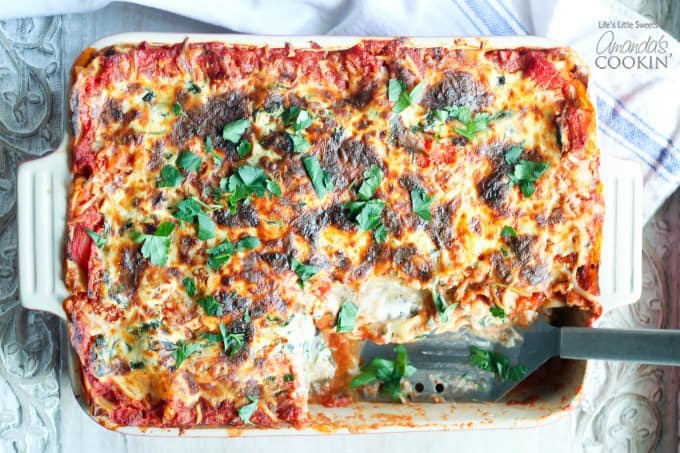 It also has ricotta and mozzarella cheese with oregano which adds to it’s delicious flavor. Feed a crowd and feed your family with this hearty dish! Saute baby spinach with 2 tablespoons of olive oil and a pinch of salt over medium heat in a large pan with a lid. Allow to cool. Saute the sliced Crimini mushrooms with 1 tablespoon of olive oil and a pinch of salt in a medium pan for 4 minutes over medium-high heat (you could also use the same pan as the spinach). Allow to cool. Bring a large pot of water and 1 tsp. salt to boil. Cook lasagna noodles for 10 minutes (defer to the directions on your lasagna noodle package). Carefully, remove from water when they are cooked and set aside on a plate to cool. I suggest drizzling a little olive oil over them so they do not stick. In a large mixing bowl, combine pasta sauce, chopped plum tomatoes and 2 cups of grated zucchini. In a large mixing bowl, combine thoroughly the ricotta cheese, cooled sauteed spinach and oregano. Assemble: Spread 1/2 cup pasta sauce mixture evenly in an ungreased 13 in. x 9 in. pan. Using an offset or baking spatula will help with spreading layers. Lay 3 lasagna noodles on top. Spread 1 cup pasta sauce mixture on top of noodles. Scoop 1-1/2 cup of the spinach mixture and drop onto the sauce layer by small spoonfuls. Spread the spinach mixture evenly being careful not to mix the layers. Lay 1/3 of the mushrooms evenly. Sprinkle 1 cup of shredded mozzarella cheese over the mushrooms. Repeat 2 more times or until the top of the pan is reached. For me, it's always 3 layers of noodles (9 noodles total). Cover with aluminum foil (leave an air pocket so the foil is not touching the last mozzarella cheese layer) let it sit in the refrigerator for 8 hours. Preheat oven to 400 degrees F. Bake covered with aluminum foil for 45 minutes. At 45 minutes in, remove the aluminum foil and bake for another 10 minutes (55 minutes total baking time). You can also broil for a few minutes to get a crust at the top (as shown in the photos), make sure that the dish is several inches away from the broiler and broiler safe). When done, the Veggie Lasagna should be bubbling on the sides, allow to cool for 10 minutes before serving. Garnish with fresh chopped basil or Italian parsley. Salt and pepper to taste. Enjoy! There may or may not be leftover filling depending on how heavy you spread it, if there is you can use the extra to make lasagna roll ups with any extra lasagna noodles you might have. Can I use eggplant in here somewhere? Hi, Judy! I don’t see why not. I would saute the eggplant in a little olive oil and add them right into the recipe. Let us know how it turns out! I’ve never made lasagna before and actually love veggie lasagna so I think, after seeing this recipe, that all needs to change. This looks sooooo good! I hope you enjoy it! Making lasagna is actually pretty fun and it’s so impressive when being served!